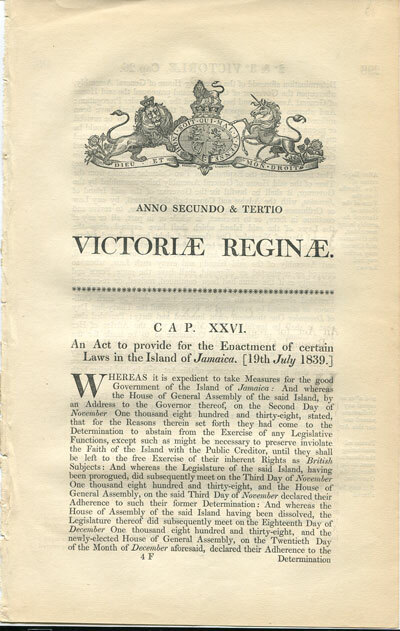 1839 (19 July) An Act to provide for the Enactment of certain laws in the island of Jamaica. STOKES A. A view of the constitution of the British Colonies - in North America and the West Indies, at the time the civil war broke out on the Continent of America. xvi + 561pp. Facsimile reprint of 1783 first edition, very fine in brown cloth. INGRAM K.E. The Q.C. and the Middleman. xiii + 203pp. 1st ed., fine in card covers. HMSO Extracts from Papers, - printed by order of the House of Commons, 1839, relative to the West Indies. Arranged under the following Heads:- 1. Progress of Industry and General Condition of Society since 1st August, 1838. 2. State of the Law as it now stands. 3. New Laws proposed to meet the new relations of society. 4. Administration of Justice. 5. Prison regulations, &c. 6. Laws relating to Immigration and Deportation from one Colony to another. 7. Proceedings of the Legal Legislatures. xxiii + 678pp. 1st ed., clean in orig. worn blind stamped cloth. Front hinge repaired. KNOWLES Peter Malawi Postmarks. Rhodesian S.C. 1980 17 large pp + map. 1st ed., clean in card covers.